Empowered by State of-Art infrastructure and an dexterous team, We are one of the leading Manufacturers, Exporters, Suppliers and Traders of an unmatched range that include all the raw materials used for jewellery manufacturing. 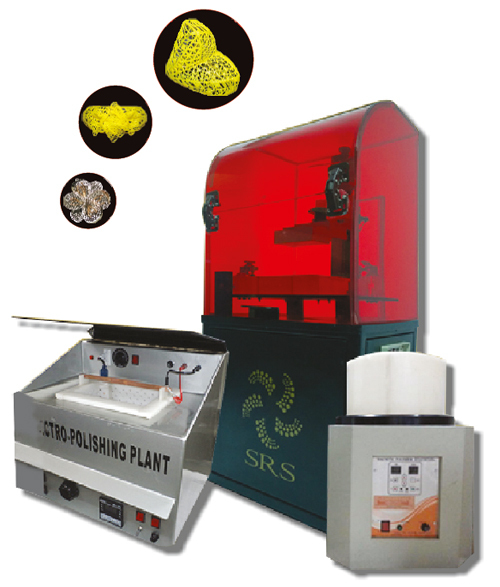 Backed by 8 years of industry experience, we “SRS Jewelkon India Pvt. Ltd.” are one of the eminent manufacturers and exporters of a superior quality of Silver & Gold Alloys and Plating Solutions. Besides, we also offer, Electro-polishing Plant, Wax magic spray, PSP Cleaner, Consultancy Services regarding Technical Setup, Process Set Up and Factory Setup and Gold Loss Reduction Techniques, etc. Moreover, we guarantee complete service back up in order to improve quality at client's end. Further, in our product range we offer Gold Loss Controller, Rhodium Loss Controller and Diamond Dust Settler. These unique technologies are used to reduce your Gold loss, Rhodium loss and Diamond loss respectively. We possess a state-of-the-art infrastructure that is well equipped with modern machinery and latest equipment that enable us in meeting the bulk requirements of our clients. After the products are manufactured, these are stringently checked on the basis of well-defined properties so as to ensure flawless range to the clients. Owing to defect-free products and client centric approach, we have been able to carve a niche in this domain within a short span of time. Further, with our dedication and trusted clients, we have been able to expand our business not only in Indian but also overseas markets. We are headed by our mentor, Mr. Shankhesh Shah. Owing to rich industry experience and constant guidance & support, we have been able to strengthen our position in the industry.